In the wheatfields of the”Prairie State” of Kansas—the”Indian country” of the years following the Civil War—lies a Cavalry Post and Government reservation of 22,000 acres, known as Fort Riley, named in honour of Major General Bennett Riley, U. S. A. Here is now located the Cavalry School of the United States Army and here the officers of our mounted services pass through the required courses in equitation and horsemanship, and kindred subjects, and at graduation must demonstrate their ability to cross a difficult terrain with many varied obstacles, both natural and artificial, at speed on horseback. What is more logical, then, than to find that the authorities have recognized the value of a pack of hounds as a means of training for the student officers and have encouraged, to the best of their ability with limited financial support, the organization known as the Cavalry School Hunt? It cannot be doubted that hounds of various breeds and qualifications, for hunting coyotes and other native wild game, have been kept by officers stationed at Fort Riley since the foundation of the Post—such being usually the case wherever Anglo-Saxons are isolated amid frontier conditions, the world over—and there are traditions of a pack of staghounds and a few wolf hounds which were hunted in the early part of the century by an enthusiastic young subaltern of the Sixth Cavalry—Lieutenant (later General) Francis C. Marshall—who, with a brother officer, was so tragically lost in the desert, following the forced landing of their airplane, after both officers had returned safely from gallant and distinguished service in the World War. 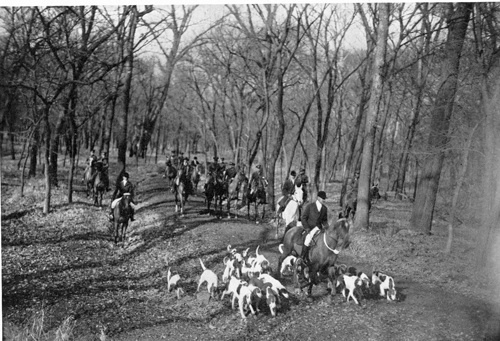 Also, in 1908, one finds records at the post of coyotes being hunted with “trail hounds,” and jack rabbits with “sight hounds” (probably greyhounds), but it was not until 1910 that another subaltern of cavalry, Lieutenant (now Colonel) Gordon Johnston, established the first pack of foxhounds, with drafts from the Genesee Valley, generously donated by that gallant Spanish War veteran and ” Dean of American Masters of Hounds,” Major W. Austin Wadsworth, M. F. H. These were English foxhounds of pure lineage, and were at first hunted on coyotes, but, on account of the wretched scenting conditions due to dry climate and high winds, it was found necessary to run drags in order to provide a good gallop for a hard-riding Field, and in 1912 riding to the draghounds was officially recognized by the school authorities and required as a part of the curriculum for the student officers. This was largely due to the efforts of Major (now Colonel, retired) George Patton, a distinguished cavalry officer, who brought the drag pack to a high standard of performance during his Mastership, which followed that of Gordon Johnston and was only interrupted by the entry of the United States into the World War. During the War period the hounds were left in charge of Lieutenant (now Major) D. B. Leininger, who kept them in excellent condition but attempted no regular hunting, owing to the absence of a Field; and in 1919, on the reopening of the school, he turned over to the new Master, Major D. W. McEnery, an unusually nice lot of hounds, to serve as a nucleus for the present pack. Major McEnery started in at once with great energy to improve the quality of the pack by organizing a subscription with which to purchase drafts, and by securing donations of hounds from such well-known hunting men as Messrs. Percy Rockefeller, Joseph B. Thomas, Raymond Belmont, Willis Sharpe Kilmer, and General Roger Williams, with such success that, by the season of 1919, he had replaced all but two couples of the original pack with better entries. In 1921, he applied for recognition of the pack by the Hunts Committee of the National Steeplechase and Hunt Association, which, of course, was readily granted, and Major McEnery was also, at the same time, elected a member of the Masters of Foxhounds Association of America. In 1923, through the generosity of Major General Henry T. Allen, commanding the American Forces in Germany, the entire Coblenz Hunt pack, which had been hunting the country on the east bank of the Rhine, at Coblenz, Germany, and which contained a number of French hounds, of ancient lineage, was added to the pack. 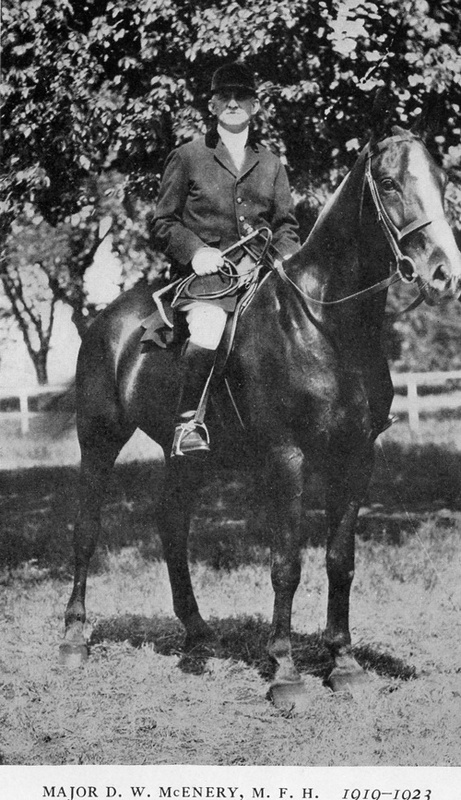 Captain Harry R. Kilbourne, cavalry, succeeded to the Mastership in 1923, and for two seasons carried on the breeding and other policies of his predecessor, under whose regime he had served as one of the Honourary Whip-pers-in—who, by the bye, are selected by the Master from the Instructors in the Department of Horsemanship—and we are indebted to him for much of our information about the Hunt at the present time. The country is prairie, with many canons and all styles of fences and artificial obstacles, which try the cleverness and courage of horse and rider in many ingenious ways, but thoroughbreds are greatly in the majority, since the pace is tremendous. There are twenty thoroughbred stallions owned by the Government standing in the State of Kansas, and good horses are plentiful on the neighbouring farms and ranches. The School horses are, almost without exception, products of the Remount Stations of the Army and are of extremely high quality in these latter years. 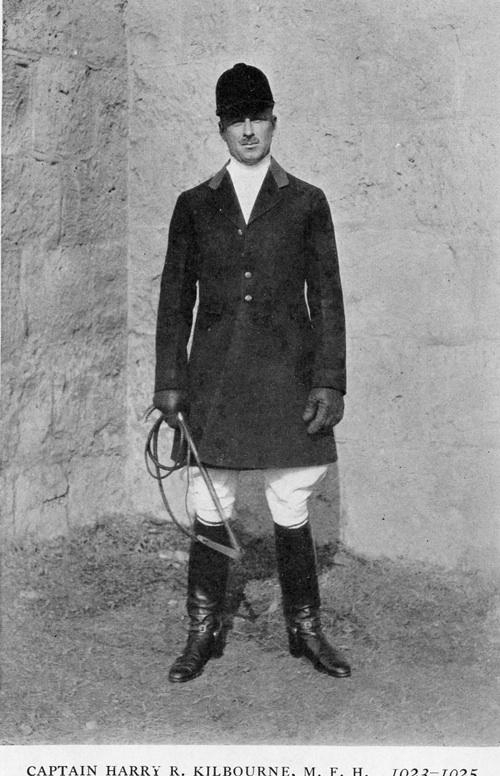 Captain Robert W. Grow, cavalry, the present Master, is of the same opinion as his two immediate predecessors on the policy of hound breeding, and now has about twenty-five couples of the English-French-American cross in the kennels, with which he is showing first-class sport two days a week, from October to April. The Master and Hunt Staff turn out in regulation scarlet, with forest green collars and yellow waistcoats, while most of the Field, of course, hunt in the Service uniform. The hunting territory of this fortunate Hunt, being a government reservation, is absolutely free from that curse of most present-day countries, namely, wire; while the Field, being under military discipline, must be a joy to a Master’s heart. And last, but not least, the “irate landowner” is an unknown quantity to the thrice-blessed Master of the Cavalry School Hunt. A thread on the Ft. Riley Hunt was recently posted on SMH which would likely interest those interested in this topic here.